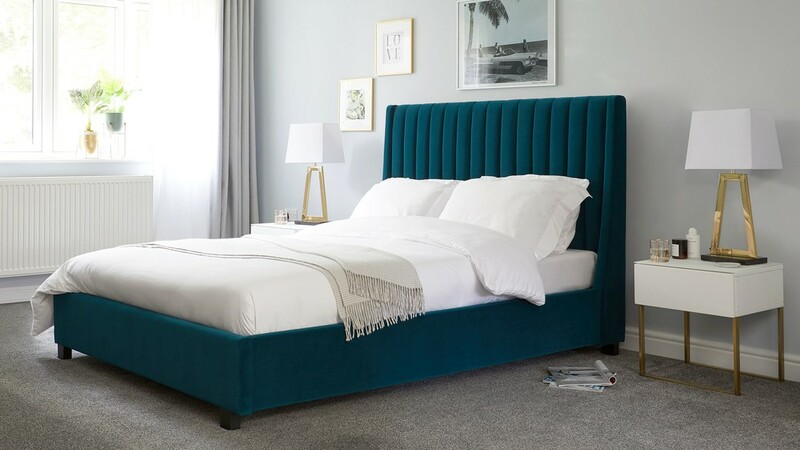 A rich peacock velvet upholstery combined with a modern shape, the Amalfi super king size bed is perfect for those who want to create a luxe look with the added benefit of extra storage. The frame is made from sprung slats which helps to increase the overall comfort of the Amalfi bed. 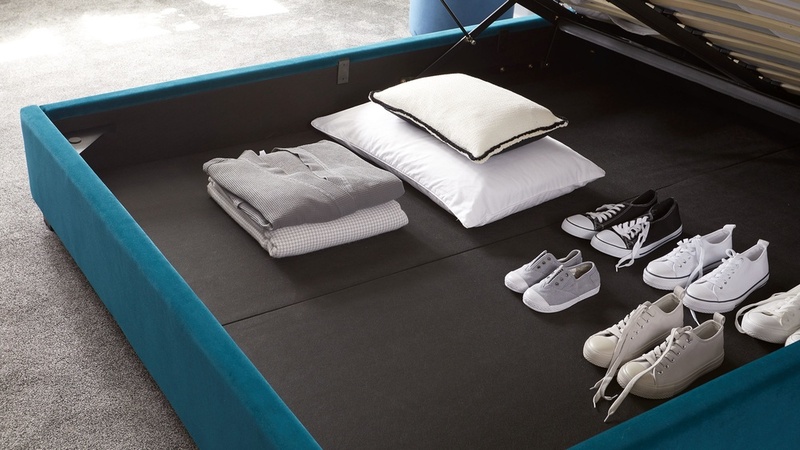 This is because the frame is effectively helping the mattress be in the best, most supportive position. It's a really premium feature that will help you get the most out of your bed and mattress. 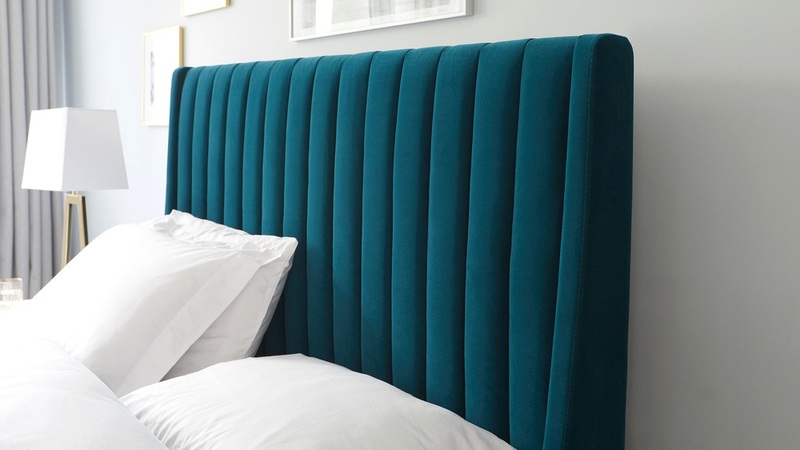 Having a taller headboard gives a bed a more formal and impactful look in your room. This, combined with the vertical panels and shallow 'wings' that go down to the base, creates a nice inclusive feel whilst still being open and inviting. The velvet upholstery used for the Amalfi bed is a short pile polyester velvet but with the softer, matt appearance of a cotton velvet. This means you get the soft look and texture of velvet without the sheen. It's a far more accessible way to introduce a plush velvet finish to your home. 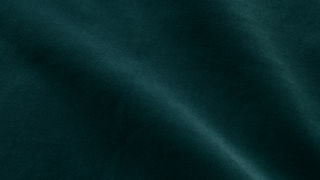 The peacock velvet is a dark teal colour, so it has a lovely rich appearance without being too dark. Because velvet has a pile, it naturally reflects the light so the colours actually feel lighter than they seem. The Amalfi super king size bed is also available in a double or king size depending on the size of bed you need for your space. The taller headboard of the Amalfi gives this bed a more formal and impactful look, adding both height and a contemporary vibe to your room. We’ve selected vertical panels and shallow 'wings' that go down to the base of the headboard which is further accentuated by the smooth peacock velvet upholstery. Stylist’s Tip: Lighting will change the look of your velvet, especially with panelling like on the Amalfi. Bright daylight with really show off the sheen on the fabric, where moody, lamp-lit rooms will make the colour appear deeper and richer. Think about this when position your new furniture to achieve the perfect look.